David Reno Bacuzzi was born in Islington 12 October 1940 into a family that had Italian connections on his father’s side. His father became a footballer playing for Fulham and played a war time international for England. Dave was one of the first players brought into Arsenal by Ron Greenwood and he came as a trainee amateur right back signing pro forms in 1959. Curiously, given his father’s background some sources say Dave’s first match was against Fulham but I see him first playing in an away game against WBA on 18 February 1961, which we lost 3-2. However Dave then kept the right back position for the last 13 games of the season, taking over from Len Wills who made 24 appearances in the position that season. Jimmy Magill played the other matches. The following season the right back position was held by Magill (21 league games) and Bacuzzi (22 league games) but thereafter his standing at Arsenal faded and ultimately he made under 50 starts in the league in six years. 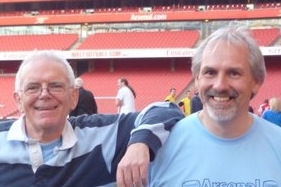 But he played in the Arsenal Reserves team that won the Football Combination in 1962/63. His last Arsenal league game was on 14 March 1964 a 2-4 home defeat against Chelsea with Billy Wright as manager. After that he moved to Manchester City on 24 April 1964 for a fee of £25,000 with whom he won the second division championship in 1966, moving on to Reading on 9 September 1966. In 1974 Dave moved on to be manager of Home Farm with whom he won the FAI Cup for their only time – the first amateur team to win the cup in a generation. They went on to play Lens in the Cup Winners’ Cup and actually drew the first (home tie) before going out in the away game. We last hear of him in football in 1985 as assistant manager at Shamrock Rovers, and it is said he subsequently opened a travel agency in Dublin. At the time of writing he is 74 and we all wish him a long and enjoyable retirement. If you have any further information on Dave please do write in. 4 comments to Dave Bacuzzi: Arsenal right back who took an amateur team into the Cup Winners Cup. eI saw Dave Bacuzzi play for us in a 1-1 draw at Old Trafford in 1961. Bobby Charlton was his direct opponent, as he had a period as a left winger. Early in the game he “skinned” Dave and put in a cross from which they scored. After that one incident, Dave played him out of the game and took the ball off him in every challenge. He seemed a very classy player. I remember that Jack Kelsey played in that game, as did Bill McCullough, Gerry Ward, John Snedden, David Herd and Joe Haverty. I’ve just seen Dave Bacuzzi at Dundrum Town Centre, a large shopping centre in this part of Dublin.He still looks tall and straight.I interviewed him on local radio about twenty years ago.We had an interesting chat. When he heard about the job in Cork he was wondering where Cork Island was, of course it was Cork, Ireland!.I asked him if he had played in the Fulham v Arsenal game on Good Friday 1961 (I’m a Fulham fan and this was my first time seeing them).Yes,this was one of his early games with team. He got concussed during the match and for a few minutes he thought he was playing for Fulham; not surprising as he was very familiar with Craven Cottage due to his father’s many years as a player and coach with the club.He is a very pleasant guy who lives here in south Dublin. When Dave was at Reading he did a bit of coaching with us (Mapledurham & Caversham Heights FC). He was a very pleasant chap and was popular with the players. We have 4 reunions every year in Reading and hi9s name often comes up in conversation. We actually had one last evening 17th Sept 2018 and his name came up then. We all say that we would like to meet up with him again and swap stories. I moved down to the westcountry in 1969 and played western league football as a semi-pro for Barnstaple Town and later Exmouth Town. I’d love to catch up with him again.